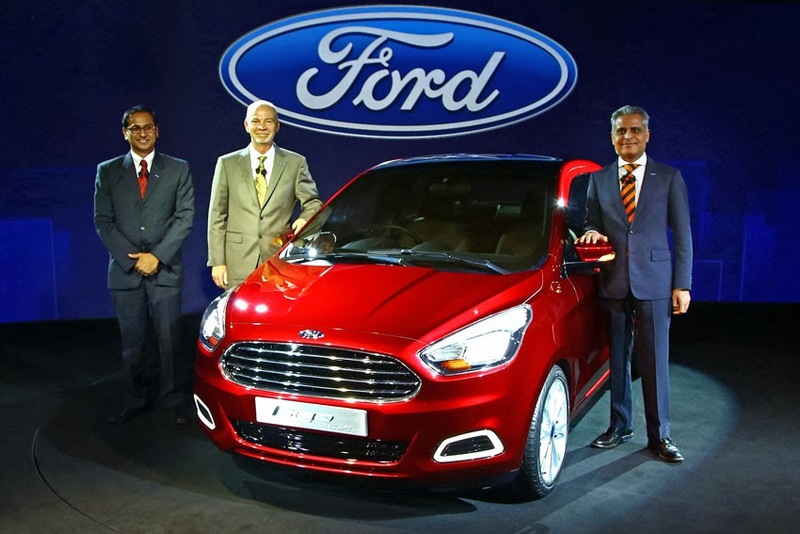 Ford revealed its vision for a global B-segment compact car featuring premium design and segment-redefining smart and safety features ahead of the 2014 Auto Expo in New Delhi. quality and craftsmanship in the B-segment, aiming to exceed the expectations of consumers in India and other emerging markets. While created for India at less than four-metres long, the concept displays a purposeful presence and a no-compromise aesthetic that continues Ford's design leadership in the compact car market globally. "With the Figo Concept, we are showing that choosing a compact sedan does not mean compromising on premium design or smart solutions," said Kumar Galhotra, Vice-President of Engineering, Global Product Development, Ford Motor Company. "The Figo Concept stands out and surprises, offering a more premium and refined feel than you would expect in such a package." "In design, connectivity and safety, the features in the Figo Concept are at the forefront of smart technology," added Galhotra. "The Figo concept was envisioned with the Indian market in mind, and created with global standards of design, quality and performance. It is the perfect symbol of how we continue to build on the One Ford plan to go further for all of our customers." Ford India President Nigel Harris, added, "Consumers are more demanding than ever, wanting and expecting more from their cars, even if they are first time buyers. "They expect and demand great fuel efficiency and low cost-of-ownership from the initial price throughout the life of the vehicle. The Ford Figo Concept offers all of this, and more, with sophistication, fresh design, world-class quality, a roomy interior, and innovative smart and safe technology." With the goal of bringing unexpected levels of refinement to the compact car segment, designers created the Ford Figo Concept using design elements common to more expensive vehicles. The front trapezoidal grille strongly communicates Ford's design DNA and shapes the vehicle's hood, giving it a powerful look. Moving rearward, designers inclined the windshield as much as possible to give the vehicle a sleek, fast profile that communicates a high-end image. Bold, elongated and blacked-out headlamps accentuate the Figo Concept's sporty appearance. In an example of the close attention designers paid to the smallest detail, a slight grain in the headlamp plastic enhances the parabolic shape inside. Sweeping, curved lines moving from the front to the rear of the vehicle create a sense of movement. Designers used light-catchers along the sides of the vehicle, giving the Figo Concept a robust and muscular presence. "The Figo Concept represents our vision of a refined, no-compromise approach to designing a compact car," said Ehab Kaoud, Chief Designer, Ford North America, who led design for the Ford Figo Concept. "So often in this segment you see designs based on current trends and fashions that quickly look dated. We wanted instead to create a premium, long-lasting design that is clean and elegant, and which conveys a sense of precision, efficiency and sophistication." Smart design features like electrically adjustable power-fold mirrors are practical, helping to remove the stress of driving through a busy and congested environment. The mirrors' flexible architecture prevents them from being broken off if bumped by another car or motorbike. And Ford designed the Ford Figo Concept to feature unprecedented levels of safety for its class, further enhancing the driver's peace of mind. Moving inside a spacious cabin filled with innovative stowage spaces, the Ford Figo Concept delivers surprising features that bring the promise of tomorrow's technologies to drivers of compact vehicles. With an innovative device dock, the Figo Concept introduces a new way to store, mount and charge devices such as mobile phones, MP3 players and satellite navigation systems, seamlessly integrating them into the in-car entertainment system.